Locksnapping continues to be a problem and is here to stay. Have your existing weak locks upgraded to high security antisnap versions. This will prevent a thief entering your home or business unlawfully through lock snapping and keep you and your contents safe for the future. Weak euro cylinder locks on your doors! The locks fitted to the vast majority of uPVC and some composite, aluminium and wooden doors are called "euro cylinders". Though people tend to call them "barrells'. The euro cylinder in constructed mainly with the metal brass. This is because brass does not corrode and so requires no lubrication durings it's lifetime. It is also a soft metal and easy to manufacture to suit all door thicknesses. This euro cylinder though has a vulnerable weak point which has been kept unknown until recently. Now this weak point is being exploited by thieves and used to gain access to homes and businesses throughout the South Yorkshire region. Put simply, if a little force is applied to the cylinder it will break in half and then can be pulled out. This allows access to the unlocking part of the door lock itself. High secure, antisnap locks fitted by SF Locksmith. But together we can beat the thieves by exchanging the locks originally fitted to your doors for antisnap locks. The appearance of the door does not change but the security is beefed up considerably. A recent article in a local Sheffield newspaper stated that in every case where an antisnap lock had been fitted, the thieves had been foiled and did not get in! Though thieves do in nearly every case try to snap locks, these extra features help to evade all options that a professional thief may use. How do i know if my locks are not the antisnap type? Being honest you won't. Putting a date on the door being fitted will not help. Brand new properties being built today in Rotherham are not obliged to have these new type of locks fitted. That also means new doors fitted to existing properties also will be the same. The only sure way to check is to take the lock itself out and then it can be examined for the antisnap protection. If you are unsure SF Locksmith will do this for free of charge and offer a free quote at the same time. Pas 24 handles- the ultimate protection. I hear that homeowners are told if the lock is flush with the handle and so not sticking out, you will be safe. This is wrong! The thieves will break the bottom part of the handle surrounding the lock off. This exposes the end of the euro cylinder which can then be snapped. To combat this, handles are available to thwart this attempt. Called pas 24 handles, they protect the cylinder and create a serious challenge to any thief. They also offer a visual deterrant and can result in any potential thief just going elsewhere! Pas 24 handles do not fit all doors but certainly the vast maority fitted within the last 15 years. 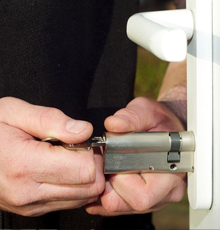 For more information on high security anti-snap locks in Rotherham contact SF Locksmiths now. Excellent service, quick, friendly and reasonable price.